We have received 13 titles in Nursing Theory from six publishers in the last 12 months, with the majority from Honor Society of Nursing Sigma Theta Tau International, Springer Publishing Company, and Jones & Bartlett Learning. So far, we have published reviews of nine of them, with two currently out for review. The prices of these books range from $34.95 to $89.99, for an average price of $62.13. 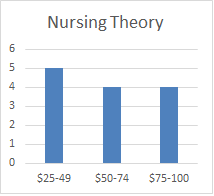 Despite the relatively small annual publication output in Nursing Theory, Doody’s Core Titles 2018 features 24 titles in the specialty, again dominated by the same three publishers, with 18 of them selected as Essential Purchase titles, perhaps a reflection of the importance of this specialty to nursing scholarship.